2) THE AUDIO: Whether you choose a sound bar, stereo speakers, or a surround sound system for your home theater, make sure you choose the audio setup that fits your needs. Sound bars take up little space and have become quite popular, but nothing beats a full surround system for true audiophiles. If you choose the surround option, however, be sure and spend time figuring out where to best place each speaker to achieve the optimum surround effect; you will want to coordinate their placement with where the seats will be placed (and for that, you need to know what type of screen you will be using). If you choose stereo speaker towers, make sure to reserve enough space, and make sure that their larger size will blend into your planned theater decor. For further assistance on which audio setup to use, look here. 3) THE SEATS: Choosing the right home theater seat will depend on which materials, design, and features you're looking for. Families with children or pets may want a chair constructed with low maintenance materials, that is easy to clean. Those looking to spend time with a loved one will want a loveseat configuration, or an optional wine class caddy accessory. Want to add an authentic lounge experience, with mini-bar capabilities? Try the Madison refreshment console sofa. Meanwhile, those looking to optimize the range of entertainment possibilities at their fingertips will be looking for a seat with a tablet holder or USB ports. 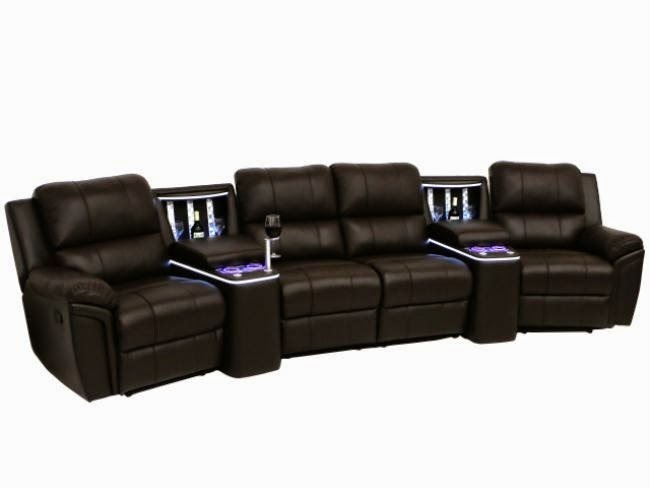 4seating offers home theater seats in a wide array of material, color, design, and feature combinations that make the choice easier; the Liberty or Baron are two outstanding seats which come equipped with a USB port by the power switch. Those looking to optimize space in their home theater can take advantage of a special "wall-hugger" design which allows most chairs to be placed just three inches from any wall, even in full recline. Other home theater seats come with space-saving armrests, but even with these handy features, make sure that the theater is not cramped. You do not want a row of seats too close to the wall or right in the center of room, as neither option allows for optimal acoustics. Experiment with the placing of your seating, to find out which placement will allow you to enjoy the sound from your home entertainment system to the fullest, and coordinate with the placement of the speakers. Also, the actual arrangement of the seats must be carefully considered, whether you choose straight or curved, loveseat or sofa configurations. 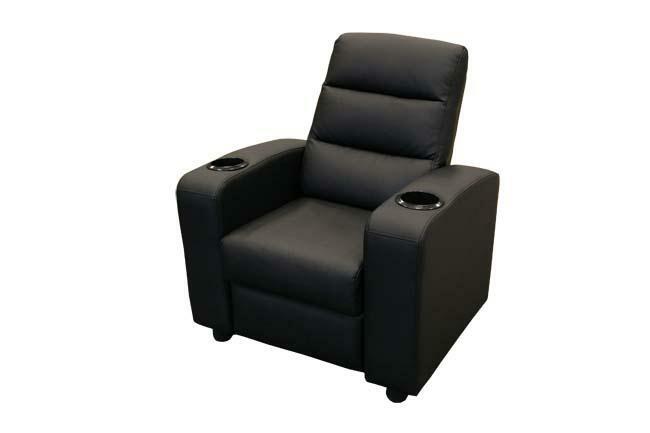 Finally, make sure that whatever home theater seating you choose is a comfortable fit for any children; to that end, the Bebe is a special chair from Seatcraft which was specifically designed for a child's smaller frame. There are other things to consider as you plan: how to minimize a complicated wire setup (especially with regards to surround systems); where to place wall accents, columns, screen frames, and curtains; and whether to choose back row seating or seat risers, for multiple row configurations. 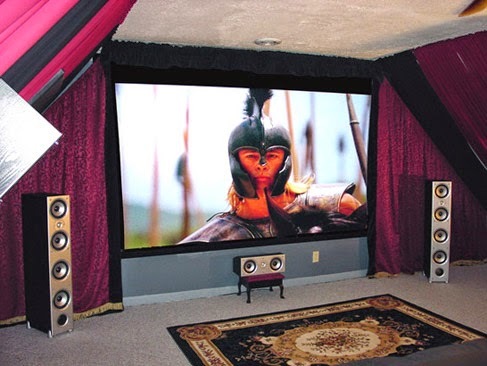 For these considerations, a glance at our earlier article on home theater decor will help you decide which decor strategies can work for your individual needs. Whichever way you end up choosing however, carefully consider the available options and have fun crafting your own perfect family home theater!